Okay, I tried to take a picture of these with my new camera that I don't know how to use yet and then the battery died so I apologize for the slightly blurry photo. I swear they were delicious. 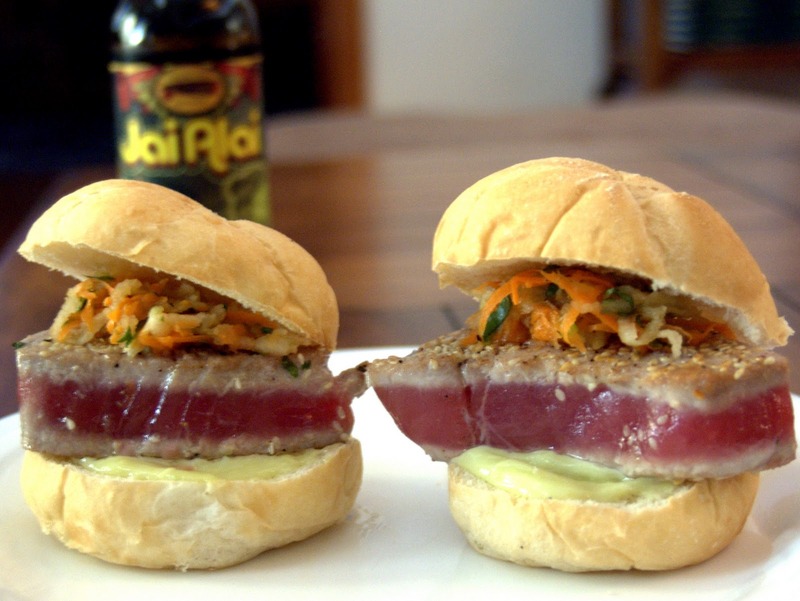 So my tuna sandwiches featured a carrot and apple slaw, wasabi mayonnaise, cilantro, and green onion. Awesome mix of flavors. I paired them with Jai Alai IPA from Cigar City. I originally wanted to pair them with Jai Alai that was aged on White Oak. Unfortunately, Total Wine was out of it. The regular IPA still worked great. At first, you might think that this beer is too big and that it would overpower a little tuna dish, but once all the components were together, they complemented each other quite well. The IPA was able to stand up to the wasabi and something about the clean fresh hop taste matched nicely with the flavors in my sandwich. This kind of sandwich is actually really easy and quick to make. You only have to mix some stuff together, sear for a few seconds, and you're ready to eat. Here is my recipe. For the slaw, combine the shredded apple and carrot in a bowl. I used a cheese grater to shred them. Add the vinegar, green onions, cilantro, and salt and pepper to taste. To prepare the mayonnaise, simply combine the wasabi paste and mayonnaise. Cut the tuna into 4 pieces. Sprinkle with salt and pepper and coat with sesame seeds. Heat olive oil in a pan over high heat. When the oil is hot, place the pieces of tuna in the pan. Sear for about 30 seconds per side. To assemble, spread the wasabi mayonnaise on a bun, place the tuna on top, drizzle with a little soy sauce, and top with the slaw and bun.